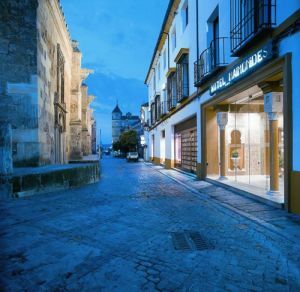 Torrijos, 4, 14003 Cordoba, Spanien. 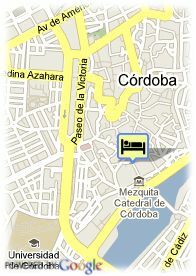 It has a privileged location facing the impressive Mosque, only 50 metres from the Cordoba Exhibition Centre. It is the best place from which to enjoy the historical citi's most emblematic sites. It has 82 air-conditioned rooms with satellite TV, minibar, heating, soundproofing, telephone, safe, magnetic locking system, daily paper and full bathroom with hair-dryer plus car park and souvenir sh. Bezahltes überdachter Parkplätze beim Hotel (12.70 €).